Today, the Royal Navy’s newest warship, HMS Queen Elizabeth entered Portsmouth harbour, her new home, for the very first time. The 65,000-tonne carrier made her historic arrival into Portsmouth on Wednesday at approximately 0710, where she was greeted by thousands of people lining the seafront. The ship will berth at the newly-named and upgraded Princess Royal Jetty at Her Majesty’s Naval Base Portsmouth, which will be home to the Royal Navy’s new Queen Elizabeth aircraft carriers. The second carrier, HMS Prince of Wales, will be officially named in a ceremony at Rosyth next month. The berth at Portsmouth has been upgraded and strengthened to support the carriers as part of a £100 million raft of infrastructure upgrades, which took place ahead of the arrival of the ship. A total of 3.2 million cubic metres of sediment, equivalent to 1,280 Olympic swimming pools has been removed from the harbour and approach channel, making it wide and deep enough to accommodate the enormous 65,000 tonne ships. 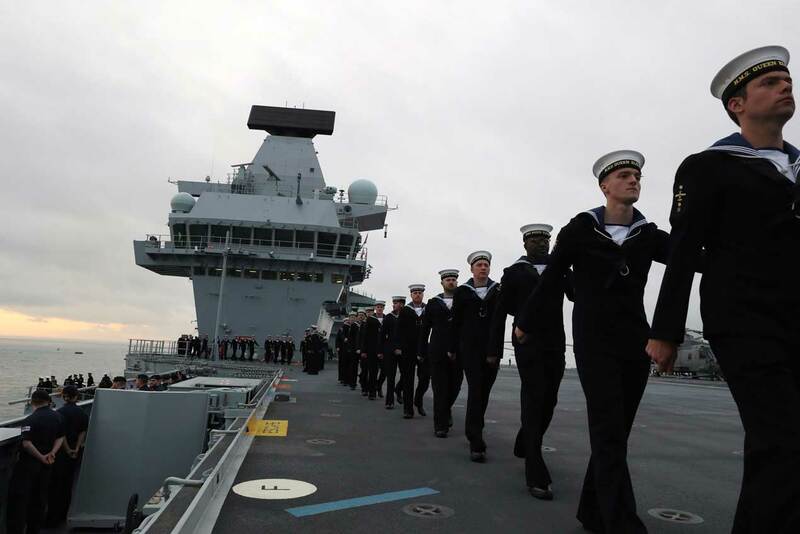 HMS Queen Elizabeth, the first of the two new Queen Elizabeth class (QEC) aircraft carriers, originally set sail from Rosyth dockyards in Scotland on the 26 June for sea trials off the north east of Scotland. The trials monitored speed, manoeuvrability, power and propulsion, as well as undertaking weapons trials and additional tests on her levels of readiness. 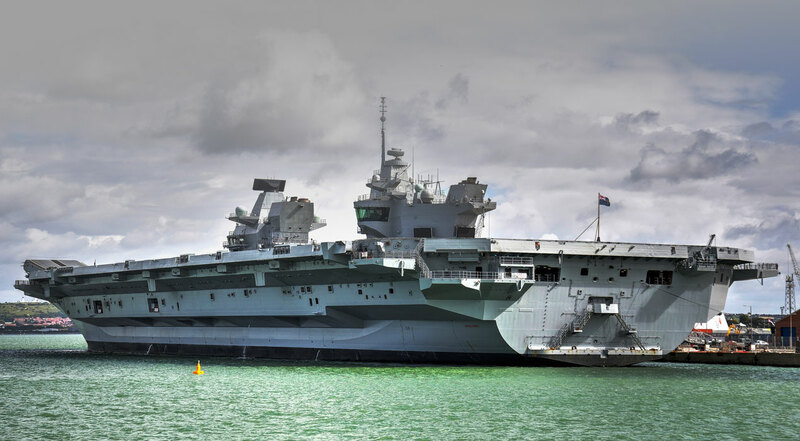 “She has made good progress in sea trials and will now embark on the next phase of preparations that will see the return of Britain‘s carrier strike ability,” said Defence Secretary Sir Michael Fallon. The F-35B and Crowsnest (an EH101 Merlin anti-submarine warfare helicopter, which from 2019, will also provide airborne early warning coverage) constitute what it referred to as “Carrier Strike” (CS). After further operational testing of the F35B throughout 2019 and 2020, Initial Operating Capability Carrier Strike (IOC(CS)) will be declared at the end of 2020, giving the UK a conventional strategic deterrent to complement the Trident submarine-based nuclear Continuous at Sea Deterrent. The QEC project was controversial from the very beginning as delivery slipped from 2012 and 2015 to 2016 and 2018, whilst the cost of building the ships almost doubled from an initial estimate of £3.9 billion in 2007 to a final sum of £6.2 billion a decade later. When 2010 brought a change of government in a challenging fiscal environment accompanied by a 2010 Strategic Defence and Security Review, which cut the Ministry of Defence’s budget by 8%, serious questions emerged as to whether the QEC could continue. However, the programme progressed due to the strategic requirement for a CS capability. Sir Peter Gershon, chairman of the Aircraft Carrier Alliance, said that more than 10,000 people had come together to bring HMS Queen Elizabeth and HMS Prince of Wales to life, from early design to the magnificent ships they are today. “We’re excited to complete the remainder of her test and commissioning programme before delivering her to the Royal Navy by the end of the year,” he said.